It's been a while since I've posted so I feel like it's time for an update. Since September I have moved twice, hung out with some amazing humans and have encountered a lot of personal obstacles. These past months I've made the switch from my old shop and have been relying on Patreon, some YouTube ads, Twitch and income from Society6 and INPRNT. It has been a huge hit to my income but I feel like this is where I am meant to be right now. I am mainly focusing on Twitch lately and I very much enjoy it. Here is the studio in our last place (who doesn't love a good studio pic?). I found that it was a bit too much for us. 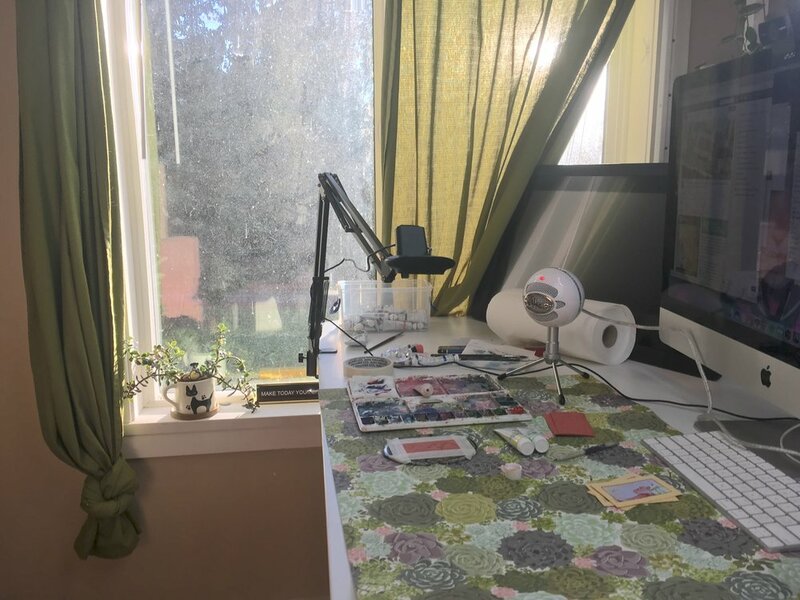 We didn't stay long as it was pricey, there was no separation between me and my partner's work spaces (we both work from home), and we wanted to try moving closer to my family. We moved to a cabin in the middle of nowhere that has proven to be cleansing but also isolating which has allowed my mental health to suffer. Many of you who follow me and my work know that I have suffered a lot with depression in the past year. I am open about it because I feel like it is very important to discuss mental health for the benefit of humankind. I have tried many things to fight this illness but nothing seems to work for me, I have recently gone in to see a doctor to test my blood and seek external help. I have been feeling much better this past week and am looking forward to being my old self. We are a half an hour from the post office and grocery store. We have a general store at the bottom of the mountain and the local population apparently triples with tourists in the summertime. It has been challenging to run a business out here but I am making do. We got the car stuck up the mountain while returning from the general store on my Birthday, everyone in the area knew about it after 2 days. I miss Vancouver Island and my island friends very much but I always wanted to try living in the woods, it's been an adventure to say the least. Here is the current studio, it is a work in progress at the moment but it'll look really nice once I can put up my artwork (including new art from J.A.W. Cooper that I am amped about). The days have been dark lately but I've been inspired to create. We put a hold on the comic that Lopi and I were working on together but I have been thinking about it a lot this past month. I've also been toying with the idea of creating a quick strip comic. I have taken a break from Youtube, as most of you know, to pursue Twitch. It is much more stable and personal which I LOVE. I might still upload the odd video on YouTube but for now I am focusing on just a few things and Twitch is one of those things. I am hoping to get partnered this month. The feeling of talking with people while I draw feels like being in art class, which is an environment I've always felt at home in. I just want to say thank you to those who have sent kind words and have supported me this past year. I am grateful to have such amazing friends and patrons on all of my platforms. You keep me inspired and motivated even in the dark days. I love you all so much and can't wait to create more for you. That's all I have to share for now but I will be posting information about upcoming gallery shows in the future so stay tuned for those!